The most controversial Marvel movie to date and one of my least favourite Marvel movies. The chemistry between Brie Larson (Captain Marvel) and Samuel L. Jackson (Nick Fury) was wonderful. When they do interviews you can see they enjoy being with each other and you can see it in the movie. The casing is good. Ben Mendelsohn as Talos, Clark Gregg as Phil Coulson, Jude Law as Yon-Rogg, Lashana Lynch as Maria Rambeau were all good casting choices but this is typical with Marvel so I wasn’t suprised. The movie relied on 90’s nostalgia with the music and the setting in which the film was shot and I would say it worked, personal highlight was the re-creation of the blockbuster store, this was excellent. The soundtrack itself like I said involved a lot of 90’s nostalgia and myself knew almost all the songs. I think Larson is a really good role model for young girls as after watching this they’ll more than likely feel empowered as Captain Marvel is the main protagonist. The CGI was good. The de-gain for L. Jackson was incredible (check out the trailer above), Marvel have done this before with Michael Douglas and Robert Downey JR.
Every character is likeable, Carol Danvers is a great symbol for young girls, Paul Coulson for multiple reasons one being that we’ve seen him in other MCU movies and has became a fan favourite, Nick Fury as he discovered and set up Shield and Talos as he’s the best aspect of the movie, keeps you entertained through-out. Mendelsohn is fantastic as Talos and I would really like to see more of him in the future. It adds nothing new or refreshing, you wouldn’t miss much if you missed out on it. It’s a formulaic Marvel origin story and doesn’t give any surprises. Just look at Ant-Man and Thor, it follows the same structure as them but the reason why I think those movies work better is because of the characters. Carol Danvers is not a popular MCU character (only to readers of the comics) so the first time a lot of people see her will literally be the first time they’ve heard her name. Thor who is my favourite Marvel character and Ant-Man aka Scott Lang have a very similar storyline to Captain Marvel in terms of narrative but with Captain Marvel it gets tiring as unfortunately you’ve seen these kind of stories before. The performances were quite inconsistent. Larson was wooden at the start of the film only having slight bright moments. L. Jackson felt a bit off, he gives his weakest performance I’ve personally seen, just a bit flat. The rest of the performances felt either flat or a bit off, I don’t know if this is just me but please let me know in the comments if you felt the same. The humour was awful. This is my biggest issue with Marvel movies but most of the humour is awful. The jokes didn’t land as they fell flat and at moments it felt like there didn’t need a joke but they did anyway. The only funny Marvel movies are Civil War, Thor: Ragnarok… that’s it for me. The editing is messy. In the first 20 minutes it’s horribly edited, the action sequences aren’t the best. COME ON MARVEL!! This is the editing team you chose, yes I understand they worked hard but it was lacking something. The action sequences have so many cuts, I think I saw 6 cuts in 2-3 seconds at one point, some movies do this well but it doesn’t work for this one. The film is bland. Visually it’s not impressive which is the biggest flaw. I was expecting this to be one of Marvels visually impressive productions but the colours are just bland. 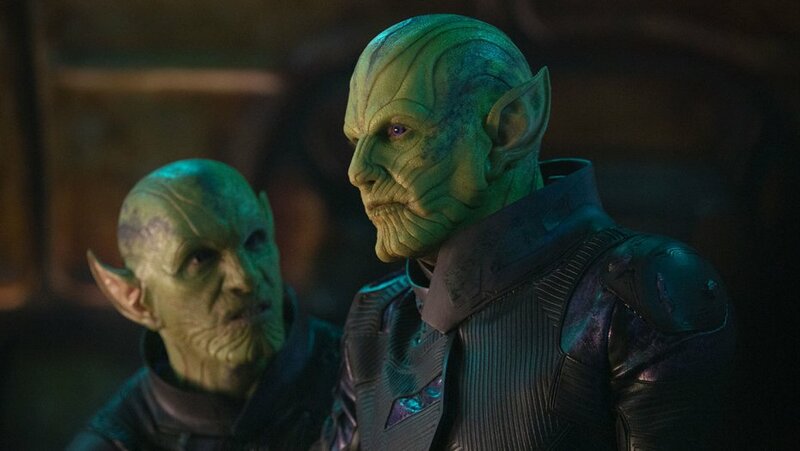 Yeah there are some scenes which caught the eye like the space scenes and when the Skrulls are on the beach but everything else was just bland. I haven’t read any Captain Marvel comics YET but her story doesn’t really grab me as much as I wanted it too which is a shame as I really wanted to get invested into her character. We learn of her past mainly through audio and quick flashes which were a bit messy and even when we focus on the present day she still wasn’t interesting. Captain Marvel is an okay film but you wouldn’t miss much if you skipped out on it, however I really hope we get to see more of her in Endgame, it’ll be interesting to see how she works with the other Marvel characters.